Gina joined CWM in the summer of 2010, bringing with her over 20 years of experience in the financial services industry. Gina was responsible for all trading operations at Kensington Investment Group Inc. and also served as compliance liaison for the trading and research departments. In addition to her trading desk and compliance background, Gina is experienced in investors' services. 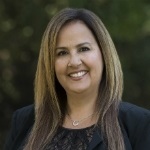 Gina resides in Danville, CA with her husband and two daughters and enjoys cooking, skiing and traveling with her family.